Cottage near Barlow, Peak District National Park, Derbyshire, England - Peaceful Location, Lovely Views, Walks From The Doorstep. Lots to Explore. 'Home From Home'. Lavender Cottage is a luxury, contemporary style cottage located within the grounds of the owners 16th &17th Century Grade II listed country house and situated in a rural and peaceful hamlet just on the edge of the Peak District National Park and near to Chatsworth House, Haddon Hall and Bakewell. The 2 bedroomed cottage (downstairs comprising of an open plan living room and kitchen/dining area with Clearview woodburning stove and all wood provided for your stay and upstairs a super king size bedded room, a twin bedded room and separate bathroom) is extremely comfortable, beautifully appointed and excellently equipped, with fluffy towels and bathrobes, quality bedding and toiletries provided. An extra mattress for a child or travel cot is available on request. All the cleaning products we use in the cottage are environmentally friendly and hypoallergenic. Enjoy the 10 acres of garden and grounds, including various seating areas, BBQ and pond with decking, delightful views and walks from the doorstep as well as the numerous footpaths and trails (including fantastic biking trails) of the surrounding countryside. Lots of recommended teashops and cafes, country pubs, restaurants and bistros serving great food, galleries and farmshops nearby. Off road parking. Bike storage if required. We moved to Derbyshire in 1996 having completely fallen in love with the beautiful countryside and all that the Peak District has to offer. Our children (now 16 and 18) were born here. We renovated our 16th and 17th century house- and subsequently Lavender Cottage which serves both as a holiday cottage as well as extra accommodation for our family and friends. As such we have made it a real 'home from home'- tastefully decorated and appointed, spotlessly clean and extremely comfortable with lots of little details to make everyone's stay as enjoyable as possible. As a keen cook I have made sure the kitchen is very well equipped. We enjoy walking, biking, eating out and generally enjoying Derbyshire and have pulled plenty of our recommendations together for you in a folder in the cottage. Should you need anything before or during your stay just get in touch- we will try and help you in any way we can. What can we say? 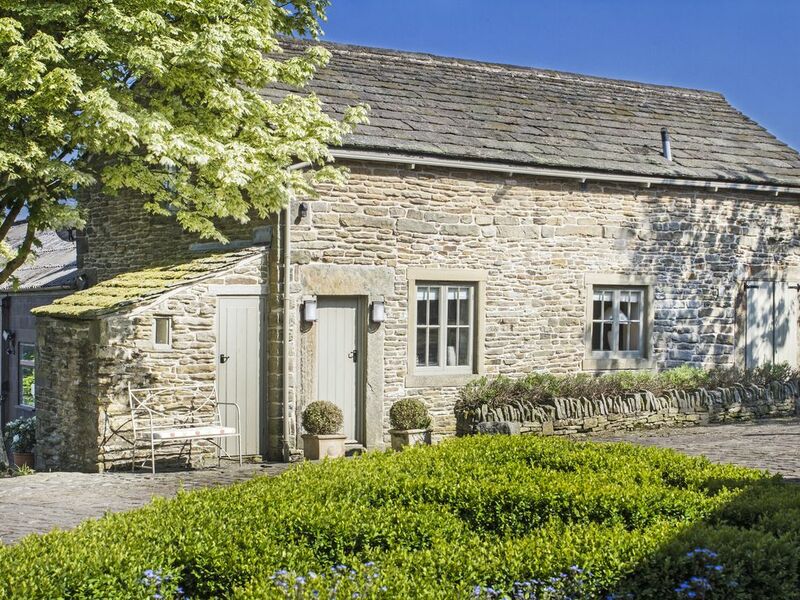 Everyone loves Lavender Cottage and is always sorry to leave due to its peaceful, rural location and wonderful views, yet at the same time being on the doorstep of so much that Derbyshire and the Peak District have to offer. The Chatsworth Estate is 10 mins drive away with its wonderful parklands as well as the House and Gardens to explore. Another 5 minutes further on is Bakewell, in the heart of the Peak District. Similarly you can be in Sheffield within 30 mins, Manchester in just over an hour and in London within 2 hours. We have been here 19 years and wouldn't want to live anywhere else! The only thing I can add is that when we lived in Lavender Cottage for a week, while we were having a new boiler put in the main house, my husband and children decided they could easily move into the cottage permanently -deciding it was more comfortable, cosy and clutter free than our own house! In the past, two different lots of friends of ours came to stay for a couple of weeks between houses and ended up staying months- no-one ever wants to leave! We do hope you enjoy your stay. The bathroom is situated between the 2 bedrooms and comprises an electric shower, wc, handbasin and electric towel rail. High quality bed linen is provided and changed weekly. The washing machine is a washing machine/tumbler in one. it can be used just as a washing machine, just as a tumbler or both. Wireless internet access is limited but is always available from the main house (which you are very welcome to come over to access) and the walled garden too should we be out or you would prefer . The cottage has a 'Clearview' Wood burning Stove which makes it gloriously cosy. An initial basket of logs, kindling and lighting materials is provided and extra logs will be provided on request. Halogen hob- very easy to use and very controllable. There is sea salt; black pepper; tea bags; instant coffee and sugar in the cottage for your use. The kitchen is very well equipped, with plenty of crockery, cutlery, glassware and serving dishes. If you are short of anything during your stay please ask and I will lend you it from the main house. Fully equipped kitchen with halogen hob, oven, fridge/freezer, dishwasher, microwave, washing machine/tumbler, kettle and toaster. Quality crockery, glassware, pots and pans, knives and extensive kitchen utensils. Table and chairs. Dining is around the kitchen table which seats 4. If you need any more chairs there are plenty in the cottage for your use at the table. There are lots of books in the cottage to enjoy during your stay. If you haven't finished it before you have to leave - take it home on us! Reminisce with a large collection of CDs and CD player to play them on! Our guests are welcome to enjoy the use of the spacious and delightful garden, 10 acres of grounds and pond with decking, as advised on arrival, from where walks and lovely views can be enjoyed. A boot/coat store is located off the living room which is also equipped with an iron/ironing board; clothes airer; picnic rugs and picnic basket for you to use during your stay etc. We have recently renovated our pond and installed decking above it, from where you can enjoy utmost peace and tranquility. Beautiful cottage and stunning grounds. Wonderful attention to detail, everything you could need was there. We took our cockapoo and it was perfect, safe for her to roam and explore the gardens. Very close to Chatsworth. very comfortable, great location, perfect for a weekend away. Everything we had hoped for, cottage was warm and cosy, garden was ideal for our Springer Spaniel to run around, owner Nicki was lovely and on hand if required without being obtrusive all in all a lovely break. Must sees: Chatsworth House and Estate; Haddon Hall; Peak District National Park. Manchester International Airport is 1.5 hours away; East Midlands Airport is 1 hour away. The M1 (Junction 29) is 20 mins away. Car is essential. The pretty village of Baslow is 4 miles away with its village store, post office, coffee shops, bistros and boutique shops. Chatsworth House and Gardens are 5 miles away and Haddon Hall and the historical market town of Bakewell 8 miles away. Chesterfield can be reached in 15 mins, Sheffield and Matlock in 30 mins, Ashbourne in 45 mins and Manchester and the white knuckle rides of Alton Towers in an hour. Fabulous walks, cycle routes and stunning Peak District scenery are just minutes away. There are lots of good restaurants, bistros, country pubs, tea rooms, cafes and farm shops nearby, the nearest pub serving food being a 0.5 mile walk away across the fields. Nearest post office in Baslow; supermarkets and banks in Bakewell and Chesterfield; nearest public telephone and bus service is in Cutthorpe, just over a mile away. Booking Notes: Telephone and email reservations will be held for 7 days pending receipt of the booking form and 25% deposit of the total charge. The booking will then be confirmed in writing. The full balance of the total amount is payable no less than 8 weeks before the arrival date. Reminders will not be sent. Bookings made within 8 weeks of arrival must enclose full payment with the booking form. An additional charge of £30 will be made for each pet. Pets will be accepted by prior arrangement only. Changeover Day: Changeover day for weekly bookings in peak times is Friday. However for 3 night breaks and off peak times this can change. We will endeavour to be as flexible as possible so please ring to discuss. Arrival after 3pm and departure 10am latest please. Notes on prices: We are happy to accept a very well behaved pet, by prior arrangement only, at a cost of £30 per pet/per week or up to 7 nights. Please note pets are not allowed on the furniture or upstairs and it is the guests responsibility to ensure this is the case. They must also not be left unattended in Lavender Cottage. Thank you.